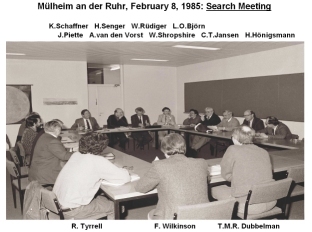 In 1984 some European photobiologists began discussing the possibility of forming a European Society for Photobiology: a literature survey showed that several European centres were actively engaged in high level photobiological investigations, thus it appeared reasonable to promote closer interactions between them. 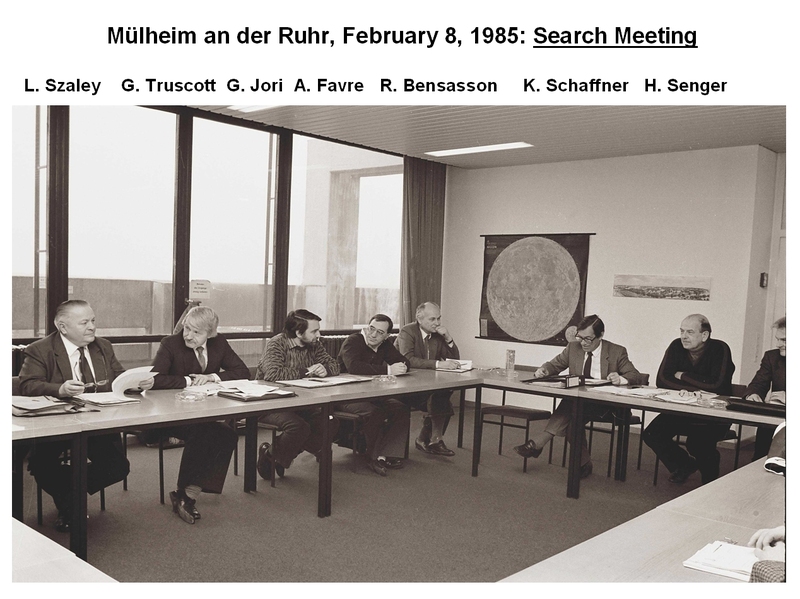 In particular, the creation of ESP would have stimulated the exchange of information, site visits and more intensive collaborations between Western and Eastern European laboratories, which had been quite difficult until that date due to political factors. For this purpose, on February 8, 1985 a task group met in the Max-Planck-Institut für Strahlenchemie in Mülheim an der Ruhr. René Bensasson (Paris), Lars O. Björn (Lund), Tom M.A.R. Dubbelman (Leiden), Alain Favre (Paris), Christer T. Jansen (Turku), Giulio Jori (Padova), Jacques G. Piette (Liège), Wolfhart Rüdiger (München), Kurt Schaffner (Mülheim an der Ruhr), Horst Senger (Marburg), Walt Shropshire (Rockville), László Szalay (Szeged), T. George Truscott (Paisley), Rex Tyrell (Lausanne ), Albert van de Vorst (Liège). 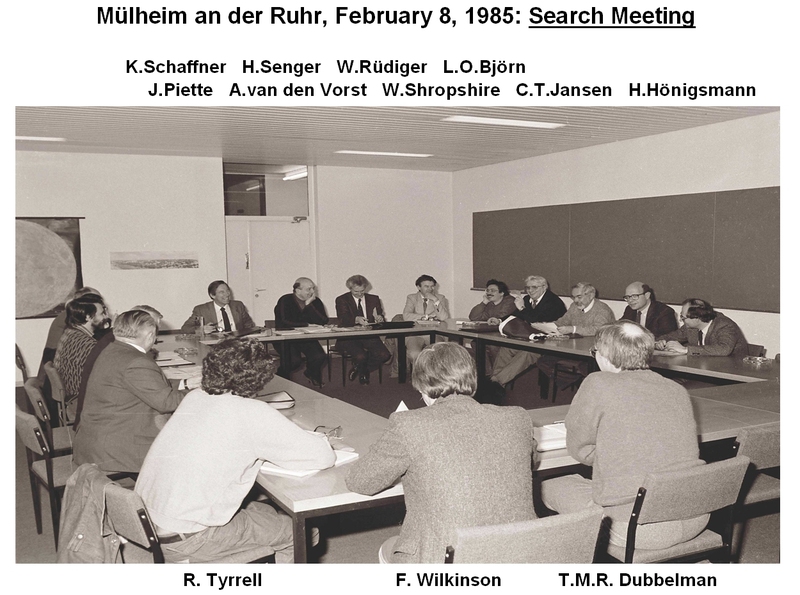 In the Strahlenchemie Meeting a Founding Committee was appointed which met for the first time in November 1985, again in Mülheim an der Ruhr. 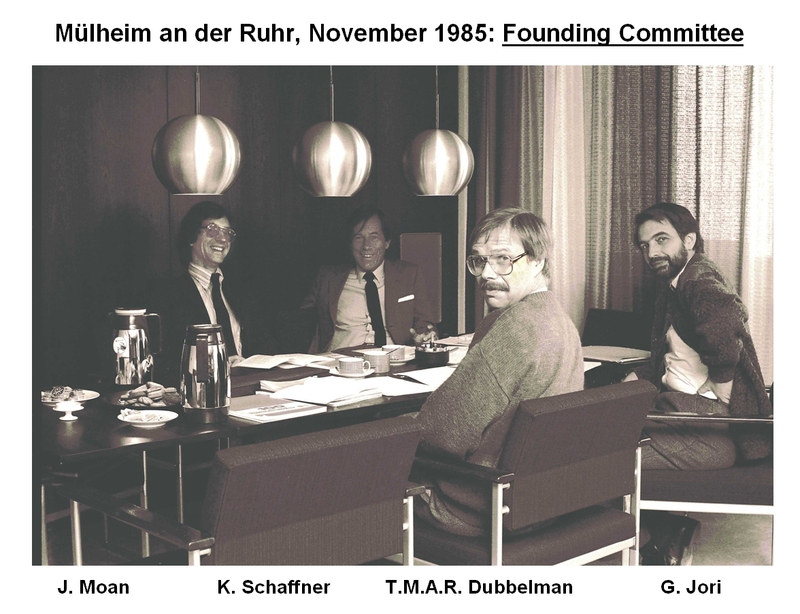 Members of the Founding Committee were Kurt Schaffner , Chair (Mülheim an der Ruhr ), Tom M. A. R. Dubbelman (Leiden), Giulio Jori (Padova), Johan Moan ( Oslo ). The ESP was finally born on the occasion of its First Congress in Grenoble ( France ) in September 1986. 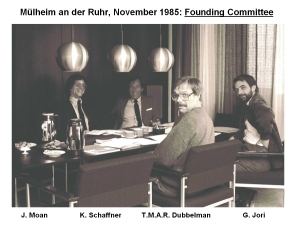 The members of the first Executive Committee of the Society were: T. George Truscott ( Paisley ) , President; Herbert Hönigsmann ( Vienna ), President Elect; Kurt Schaffner (Mülheim an der Ruhr) , Past President of Founding Committee; Rex M. Tyrrell ( Lausanne ) , Treasurer; Jean Cadet ( Grenoble ), Secretary; László Szalay ( Szeged ) , Officer. After the second congress (Padova, Italy, September 1987), the congresses of the Society have been held every second year in various European countries. Since 1987, on the occasion of the biennial congress, the Executive Committee of the ESP awards a medal to distinguished scientists whose research achievements in Photobiology are internationally acknwoledged as outstanding and who have given crucial contributions to ESP activities. In 1987 the first official journal of the ESP was published. In the first issue the President announced that ESP within a year has rapidly grown to a membership from about 30 countries, of which about 10 were outside Europe with the other 20 split between East and West Europe. The Editors-in-Chief of the first official journal have been Giulio Jori (1987-1992), T. George Truscott (1993-1998) and Tamás Vidóczy (1999-2001). The present official Journal of the Society is Photochemical and Photobiological Sciences (PPS), jointly owned by ESP and EPA (European Photochemistry Association) and published by the Royal Society of Chemistry, since January 2002. The first Editors-in-Chief of PPS for the Photobiology Section have been Tamás Vidóczy (January-June 2002), Jacques Piette (July 2002 - December 2003), Janet F. Bornman (January 2004 - December 2006). Since January 2007 the Editor-in-chief is Rex M. Tyrrell. For the Photochemistry section the first Editor-in-Chief was Frank Wilkinson and since the beginning of 2006 the Editor-in-Chief is Frans De Schryver. The organization of the book series Comprehensive Series in Photochemical and Photobiological Sciences which aims at highlighting the basic principles, state-of the-art and future perspectives in the various branches of photobiology; fourteen books have already been published and three more are in the pipeline. The promotion and support of regional photobiology congresses in both Europe and several areas worldwide, including South-East Asia, Latin America and Mediterranean countries. The organization of photobiology schools at both basic and advanced levels.